unknown. Presumably, the sPLA2-neurotoxin binds to a receptor in the presynaptic membrane and enters the nerve terminal where it impairs the cycling of synaptic vesicles, possibly by binding to intracellular protein targets  and/or by catalysing phospholipid hydrolysis . Ammodytoxins (Atxs) A, B and C, isolated from Vipera ammodytes ammodytes venom, are basic sPLA2s of group II A exhibiting presynaptic neurotoxicity. Their primary structures are very similar, but they differ considerably in toxicity, with AtxA being the most potent [6,7]. In the last few years, we have identified several Atx-binding proteins in porcine cerebral cortex: R180, which is an M-type plasma membrane sPLA2 receptor [8,9], the intracellular membrane receptor R25 , most likely located in mitochondria , calmodulin (CaM) , and 14–3–3 protein g and q isoforms . They bind Atxs in the nano- to low micromolar concentration range and may be involved in the process of presynaptic neurotoxicity. The surface residues of Atxs responsible for the neurotoxic effect have not been completely identified, but our previous studies indicate an important role of the C-terminal aromatic and hydrophobic residues Y115, I116  and F124 , as well as F24 in the N-terminal part . Recently, we have shown that the C-terminal region of Atxs, which is very important for neurotoxicity, is also critical for their interaction with the specific binding proteins, R25 and CaM . From our studies, we have concluded that, besides the C- and N-terminal regions of Atxs, some other part of the molecule should be involved in neurotoxicity. On the basis of previous chemical modification  and structural studies [19–22], it has been proposed that the hstructure region rich in basic residues might be one of the important constituents of the dneurotoxic siteT of presynaptic sPLA2 neurotoxins. In order to test this hypothesis, we studied the involvement of the h-structure basic residue cluster in the neurotoxicity, enzymatic activity and interaction of Atxs with neuronal binding proteins. with T4 polynucleotide kinase according to the manufacturer’s instructions. In addition to the mutagenic primer (50 pmol), each reaction mixture contained 10 ng of template plasmid DNA, 0.4 mM of each dNTP, Taq DNA ligase buffer, 50 pmol of each of the outer primers, supplemented with 5 U Vent DNA polymerase and 10 U Taq DNA ligase. The reaction conditions were 30 cycles of 30 s at 94 8C, 1 min at 48 8C and 4 min at 72 8C, with a final 7 min extension at 72 8C. After digestion with BamHI/HindIII, the PCR-amplified fragments encoding the last six C-terminal residues (GSIEGR) of the fusion peptide and the entire AtxA, including the stop codon, were inserted into the BamHI/HindIII-linearised AtxA expression plasmid and sequenced as above. The triple mutant AtxA(K74S/H76S/R77L) was prepared by a double-primer mutant method  using the Altered Sites in vitro mutagenesis system of Promega. The expected substitutions, introduced by the mutagenic sense primer, 5VC AAA ACG GAC AGA TAC AGT TAC AGC CTG GAG AAC GGG GTA TC-3V, were confirmed by nucleotide sequencing. The selected positive clone was digested with PstI/HindIII and the fragment encoding the second half of AtxA, from Cys61 up to Cys133 and including the stop codon, was subcloned into the PstI/HindIII-linearised AtxA expression plasmid. resolution magnetic-sector AutospecQ mass spectrometer (Micromass, Manchester, UK) as described . CD spectra were recorded in the range 250–200 nm at 25 8C on an Aviv 62A DS CD spectrometer, with a bandwidth of 2 nm, a step size of 0.5 nm and an averaging time of 3 s. Toxin concentrations in 0.1 M Tris–HCl, pH 7.0, were: 13.9 AM for recombinant AtxA, 12.8 AM for R72S, 11.0 AM for R72E, 10.1 AM for R72K, 16.1 AM for R72I, 14.3 AM for K86A, 14.0 AM for K86E, 22.2 AM for K86G, 15.8 AM for K86R, 22.4 AM for K74S/H76S/R77L. Concentrations of the mutants were calculated from their A 280 using the method of Perkins . The protein samples were scanned in a cell with a pathlength of 1 mm, and the spectra were averaged and smoothed. Fig. 1. CD spectra of AtxA and its mutants. (A) CD spectra of the R72 mutants compared with that of AtxA. (B) CD spectra of the K86 mutants compared with that of AtxA. (C) CD spectra of the K74S/H76S/R77L mutant and AtxA. Measuring conditions are given in Materials and methods. four mice (20–30 g each) were injected with a given dose of each recombinant toxin. The experiments on mice were performed in accordance with the European Commission Council Directive regarding animal experimentation. 2.7. Receptor binding studies Radioiodination of AtxC and preparation of the porcine cerebral cortex membrane extract were performed as described . The Atx-binding proteins, isolated R25 and R180, and CaM , were incubated for 30 min at room temperature with 125I-AtxC (10 nM final concentration), each in the presence or absence of unlabelled competitor (wild-type AtxA and mutants). Disuccinimidyl suberate, dissolved in dimethyl sulfoxide, was added to a final concentration of 100 AM. The cross-linking reaction was stopped by adding SDS sample buffer. Samples were analysed by SDS/PAGE under reducing conditions. Gels were dried and autoradiographed at 70 8C using Kodak XOmat AR films. The intensities of the specific bands on autoradiographs were quantified using QuantiScan (Biosoft, Cambridge, UK). The data were analysed by the non-linear curve-fitting program GraFit, Version 3.0 (Erithacus Software, Staines, UK). 3. Results 3.1. Expression and basic characterisation of recombinant toxins Nine mutants with various substitutions of basic residues in the h-structure region of AtxA (i.e. in the h-sheet and its close proximity: R72E, R72I, R72K, R72S, K74S/H76S/ R77L, K86A, K86E, K86G and K86R) were produced as Nterminal fusion proteins in the bacterial expression system, refolded, correctly activated by trypsin (as confirmed by Nterminal sequencing) and purified to homogeneity (as observed by SDS and native PAGE). The average yield of purified mutants was ~3 mg per litre of bacterial culture. The enzymatic activity value for each sPLA2 is the meanFS.D. of at least five independent measurements. The relative molecular masses determined by mass spectroscopy (the calculated mass for each mutant is shown in parentheses) were as follows: 13,747.5 (13,747.7) for R72E, 13,730.4 (13,731.7) for R72I, 13,745.7 (13746.0) for R72K, 13,705.2 (13,705.6) for R72S, 13,639.9 (13,640.6) for K74S/H76S/R77L, 13,717.3 (13,716.9) for K86A, 13,774.3 (13,774.9) for K86E, 13,703.1 (13,702.9) for K86G and 13,802.2 (13,802.0) for K86R. The observed masses confirmed the absence of any post-translational modification after synthesis of the recombinant proteins in E. coli. The far-UV CD spectra of wild-type AtxA and all nine mutants (Fig. 1) confirmed that the conformations of the latter do not differ significantly from that of AtxA. The single N-terminal sequence in all the mutants (SLLEF. . .), which was identical to that of AtxA, showed that no internal cleavages occurred due to trypsin activation. Fig. 2. Amino acid alignment of AtxA with some other group IIA sPLA2s. Numbering of amino acid residues is according to Renetseder et al. . Gaps, shown by dashes, and insertions, indicated by a’s, were used to permit the alignment with homologous sPLA2s. Identical amino acid residues in sPLA2s are shown by dots. Mutated residues in the h-structure region of AtxA are indicated by arrows. Abbreviations of sPLA2s, with references to their intravenous lethalities (unless indicated otherwise): AtxA, ammodytoxin A from V. a. ammodytes , whose lethality was recently confirmed by intraperitoneal LD50 of recombinant protein ; DPLA2, weakly neurotoxic sPLA2 from D. r. russelli (former D. r. pulchella) with intraperitoneal LD50 of recombinant protein ; BPLA2, basic non-neurotoxic sPLA2s from G. b. brevicaudus (former Agkistrodon halys Pallas) ; APLA2, acidic non-neurotoxic sPLA2s from G. b. brevicaudus ; Vipox_B, basic sPLA2 subunit of vipoxin from V. a. meridionalis with LD100 shown ; RV-4, basic sPLA2 subunit of viperotoxin F from D. r. formosensis ; Agtx, agkistrodotoxin from G. b. brevicaudus ; CB1, basic iso-subunit of crotoxin from Crotalus durissus terrificus . 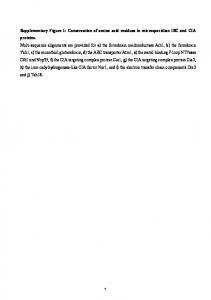 The amino acid sequences were obtained from the publicly available database at the NCBI, Bethesda, MD, USA. greatly prefer anionic phosphatidylglycerol (POPG) vesicles, the specific enzymatic activities on zwitterionic (charge-neutral) phosphatidylcholine (POPC) vesicles being lower by two to three orders of magnitude than those on anionic vesicles. The substitution of basic residues in the hregion of AtxA had relatively limited influence on the enzymatic activity of AtxA, either on POPG or POPC vesicles, with the exception of R72 when replaced by a hydrophobic or an acidic residue. The R72I mutant was 1.5and 3.5-fold more active than AtxA, and the R72E mutant 2.5- and 6-fold less active on POPG and POPC vesicles, respectively. Interestingly, even the replacement of R72 with another basic residue (R72K) reduced the enzymatic activity to approx. 60% (on both substrates) of the wild-type activity. In all other cases, the difference between the PLA2 activities of a particular mutant and AtxA was less than 2-fold. 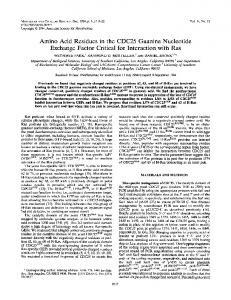 The lethalities of the mutants were up to four times lower than that of wild-type AtxA, with the exception of the triple K74S/H76S/R77L mutant (substitutions were designed on the basis of the primary structure of a presynaptically neurotoxic neutral sPLA2, agkistrodotoxin, in that region; see Fig. 2), which was 13-fold less toxic (Table 2). In the case of the triple mutant, the substitution of basic residues in the h-structure also moderately lowered the binding affinities of AtxA for the porcine cerebral cortex receptors R25 and R180, by up to 2- and 7-fold, respectively. Interaction with CaM was only slightly affected by the substitutions of K86, more by those of the K74/H76/R77 cluster (three times lower binding affinity) and most of all by those at position 72 (3, 4, 8 and 12 times lower affinity of the R72I, R72S, R72K and R72E mutants, respectively). Fig. 3. Basic residues in the h-structure region and the putative IBS of AtxA. The presumed IBS amino acid residues (L2, L3, L19, T20, F24, V31, S67, K69, T70, R72, R118, N119 and F124; shaded dark grey) surrounding the active site pocket with H48 (shown in black) faces the viewer and the hstructure is in the lower right-hand corner. The IBS residues were predicted on the basis of the homologous three-dimensional structure of human IIA sPLA2  and its putative IBS . The mutated residues in the hstructure of AtxA, R72, K74, H76, R77 and K86, are indicated. The figure, based on a three-dimensional model of AtxA , was generated using the WebLab Viewer (Accelrys, Cambridge, UK). neurotoxicity is a complex, multi-step process where different parts of the toxin’s surface are involved in protein–protein and protein–phospholipid interactions. This may also be the reason why there is no simple correlation between either affinity for neuronal binding proteins or enzymatic activity of Atxs and their neurotoxicity. Acknowledgements We thank Dr. Tadej Malovrh for help in lethality measurements, Dr. Bogdan Kralj for molecular mass analysis, Dr. Gregor Anderluh and Dr. Nika Lovsˇin for their help in the triple mutant construction, and Dr. Roger H. Pain for critical reading of the manuscript. This work was supported by grant P0-0501-0106 from the Slovenian Ministry of Education, Science and Sport, and in part by National Institutes of Health grant HL36235 to M.H.G. associates, through a non-phosphorylated binding motif, with 14–3–3 protein g and q isoforms, Biochem. Biophys. Res. Commun. 302 (2003) 691 – 696. G. Ivanovski, A. Cˇopicˇ, I. Krizˇaj, F. Gubensˇek, J. Pungercˇar, The amino acid region 115–119 of ammodytoxins plays an important role in neurotoxicity, Biochem. Biophys. Res. Commun. 276 (2000) 1229 – 1234. J. Pungercˇar, I. Krizˇaj, N.S. Liang, F. Gubensˇek, An aromatic, but not a basic, residue is involved in the toxicity of group-II phospholipase A2 neurotoxins, Biochem. J. 341 (1999) 139 – 145. T. Petan, I. Krizˇaj, F. Gubensˇek, J. Pungercˇar, Phenylalanine-24 in the N-terminal region of ammodytoxins is important for both enzymic activity and presynaptic toxicity, Biochem. J. 363 (2002) 353 – 358. P. Prijatelj, I. Krizˇaj, B. Kralj, F. Gubensˇek, J. Pungercˇar, The Cterminal region of ammodytoxins is important but not sufficient for neurotoxicity, Eur. J. Biochem. 269 (2002) 5759 – 5764. C.C. 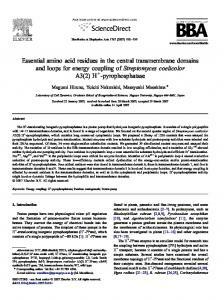 Yang, Chemical modification and functional sites of phospholipase A2, in: R.M. Kini (Ed. ), Venom Phospholipase A2 Enzymes: Structure, Function and Mechanism, John Wiley and Sons, Chichester, England, 1997, pp. 187 – 204. M.J. Dufton, R.C. Hider, Classification of phospholipases A2 according to sequence. Evolutionary and pharmacological implications, Eur. J. Biochem. 137 (1983) 545 – 551. Y.-M. Wang, P.-J. Lu, C.-L. Ho, I.-H. Tsai, Characterization and molecular cloning of neurotoxic phospholipases A2 from Taiwan viper (Vipera russelli formosensis), Eur. J. Biochem. 209 (1992) 635 – 641. L. Chioato, R.J. Ward, Mapping structural determinants of biological activities in snake venom phospholipases A2 by sequence analysis and site directed mutagenesis, Toxicon 42 (2003) 869 – 883. M. Perbandt, I.-H. Tsai, A. Fuchs, S. Banumathi, K.R. Rajashankar, D. Georgieva, N. Kalkura, T.P. Singh, N. Genov, C. Betzel, Structure of the heterodimeric neurotoxic complex viperotoxin F (RV-4/RV-7) from the venom of Vipera russelli formosensis at 1.9 2 resolution, Acta Crystallogr., D Biol. Crystallogr. 59 (2003) 1679 – 1687. F. Gubensˇek, A. Ritonja, J. Zupan, V. Turk, Basic proteins of Vipera ammodytes venom, studies of structure and function, Period. Biology 82 (1980) 443 – 447. K.B. Mullis, F.A. Faloona, Specific synthesis of DNA in vitro via a polymerase-catalyzed chain reaction, Methods Enzymol. 155 (1987) 335 – 350. S.F. Michael, Mutagenesis by incorporation of a phosphorylated oligo during PCR amplification, Biotechniques 16 (1994) 410 – 412. K. Norris, F. Norris, L. Christiansen, N. Fiil, Efficient site-directed mutagenesis by simultaneous use of two primers, Nucleic Acids Res. 11 (1983) 5103 – 5112. J.E. Coligan, B.M. Dunn, H.L. Ploegh, D.W. Speicher, P.T. Wingfield (Eds. ), Current Protocols in Protein Science, John Wiley and Sons, New York, 1995. S.J. Perkins, Protein volumes and hydration effects. The calculations of partial specific volumes, neutron scattering matchpoints and 280nm absorption coefficients for proteins and glycoproteins from amino acid sequences, Eur. J. Biochem. 157 (1986) 169 – 180. D.C. Wilton, A continuous fluorescence displacement assay for the measurement of phospholipase A2 and other lipases that release longchain fatty-acids, Biochem. J. 266 (1990) 435 – 439. S. Bezzine, R.S. Koduri, E. Valentin, M. Murakami, I. Kudo, F. Ghomashchi, M. Sadilek, G. Lambeau, M.H. Gelb, Exogenously added human group X secreted phospholipase A2 but not the group IB, IIA, and V enzymes efficiently release arachidonic acid from adherent mammalian cells, J. Biol. Chem. 275 (2000) 3179 – 3191. L.J. Reed, H. Muench, A simple method of estimating fifty per cent endpoints, Am. J. Hyg. 27 (1938) 494 – 497. R. Renetseder, S. Brunie, B.W. Dijkstra, J. Drenth, P.B. Sigler, A comparison of the crystal structures of phospholipase A2 from bovine pancreas and Crotalus atrox venom, J. Biol. Chem. 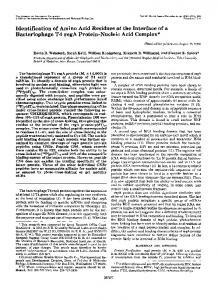 260 (1985) 11627 – 11634.
insights into nonelectrostatic molecular determinants by charge reversal mutagenesis, Biochemistry 37 (1998) 6697 – 6710. Y. Lin, R. Nielsen, D. Murray, W.L. Hubbell, C. Mailer, B.H. Robinson, M.H. Gelb, Docking phospholipase A2 on membranes using electrostatic potential-modulated spin relaxation magnetic resonance, Science 279 (1998) 1925 – 1929. S. Bezzine, J.G. Bollinger, A.G. Singer, S.L. Veatch, S.L. Keller, M.H. Gelb, On the binding preference of human groups IIA and X phospholipases A2 for membranes with anionic phospholipids, J. Biol. Chem. 277 (2002) 48523 – 48534. S.A. Beers, A.G. Buckland, N. Giles, M.H. 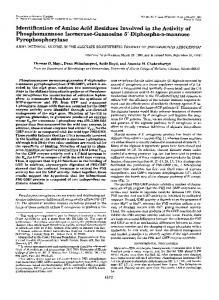 Gelb, D.C. Wilton, Effect of tryptophan insertions on the properties of the human group IIA phospholipase A2: mutagenesis produces an enzyme with characteristics similar to those of the human group V phospholipase A2, Biochemistry 42 (2003) 7326 – 7338. A.G. Buckland, D.C. Wilton, Anionic phospholipids, interfacial binding and the regulation of cell functions, Biochim. Biophys. Acta 1483 (2000) 199 – 216. L. Tang, Y.C. Zhou, Z.J. Lin, Crystal structure of agkistrodotoxin, a phospholipase A2-type presynaptic neurotoxin from Agkistrodon halys Pallas, J. Mol. Biol. 282 (1998) 1 – 11. V. Chandra, P. Kaur, A. Srinivasan, T.P. Singh, Three-dimensional structure of a presynaptic neurotoxic phospholipase A2 from Daboia russelli pulchella at 2.4 2 resolution, J. Mol. Biol. 296 (2000) 1117 – 1126. G. Singh, S. Gourinath, S. Sharma, M. Paramasivam, A. Srinivasan, T.P. Singh, Sequence and crystal structure determination of a basic phospholipase A2 from common krait (Bungarus caeruleus) at 2.4 2 resolution: identification and characterization of its pharmacological sites, J. Mol. Biol. 307 (2001) 1049 – 1059. S. Banumathi, K.R. Rajashankar, C. Nftzel, B. Aleksiev, T.P. Singh, N. Genov, C. Betzel, Structure of the neurotoxic complex vipoxin at 1.4 2 resolution, Acta Crystallogr., D Biol. Crystallogr. 57 (2001) 1552 – 1559. P. Prijatelj, A. Cˇopicˇ, I. Krizˇaj, F. Gubensˇek, J. Pungercˇar, Charge reversal of ammodytoxin A, a phospholipase A2-toxin, does not abolish its neurotoxicity, Biochem. J. 352 (2000) 251 – 255. 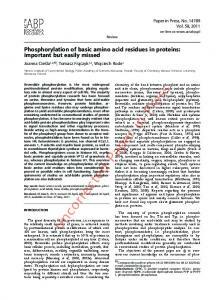 Report "Basic amino acid residues in the h-structure region ... - CiteSeerX"